Singapore is small but exceedingly wealthy, with rock solid government finances. 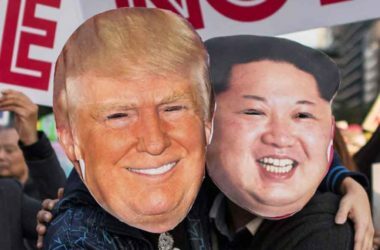 It’s also in a strategic location in Asia, the world’s fastest-growing region. The stock market is down this year and the index looks attractively priced…on the face of it. Is now a good time to buy Singaporean stocks? Recently, I had a look at how the world’s stock markets had performed so far during 2018 (see here). In most cases, the answer was pretty poorly. Singapore was down 10.5%, measured in dollar terms, although less once you add back dividend income. Since Singapore is a financially sound country, I reckoned it was time for a closer look. Past price falls are the prelude to future price gains. Basic valuation ratios look appealing as well. The MSCI Singapore index had a trailing price-to-earnings (P/E) ratio of just 13 at the end of August. It also had an attractive dividend yield of 4.2%. At first glance, that sounds highly attractive. Especially in a market where the MSCI World index of developed market stocks has a P/E above 19. Is Singapore now a major bargain? Before getting into that, it’s worth reminding ourselves of some of the basics about the place. The country has a population of just 5.6 million people. It sits in a strategic location on the tip of the Malay Peninsula, bordering Malaysia and opposite the Indonesian island of Sumatra. As such, Singapore has long been an important port between the South China Sea and the Indian Ocean. Singapore has been an independent sovereign nation since 1965. Prior to that, it was a British colony (and occupied by Japanese forces during world war II). It’s a democracy, of a kind. There are elections, but the same party – the People’s Action Party – has been in power since 1959. Despite this, the place has a reputation for very low levels of corruption. Singapore is a melting pot, as reflected in the four official languages: English, Malay, Mandarin Chinese and Tamil (from India). If you visit, you’ll find a rich mix of nationalities and ethnicities wandering on the immaculately kept city streets. The current landmass is 722 square kilometres (279 square miles), which is a little smaller than New York City. Interestingly, that land mass is 23% larger than it was in the 1960s. Land reclamation has seen to that. In the World Bank’s latest “Ease of Doing Business Survey”, Singapore ranked second in the world, behind New Zealand and ahead of Denmark. Personal income tax has a maximum rate of 22%, and corporate income tax goes up to 17%. Both are on the low side. There is no tax on capital gains and no inheritance tax. There’s also no withholding tax on dividend payments. It’s perhaps no surprise that Singapore is an attractive investment destination…and place to live. In particular, it’s developed into a well-known regional hub for financial services, such as offshore wealth management and fund management. In 2017, GDP per capita was US$57,713, ranking the country 8th in the world (just behind the US and ahead of Denmark). One thing stands out about Singapore. The government has rock-solid finances. Although gross government debt is a substantial 111% of GDP, various sovereign wealth funds amount to a minimum of 176% of GDP (and possibly much higher). This leaves the Singaporean government with a big net asset position of at least 65% of GDP. As far as I know, that kind of financial strength is only surpassed by Norway (see here). Temasek is a holding company that owns large stakes in operating businesses. It had net assets of S$273 billion (US$198 billion) at the end of March. 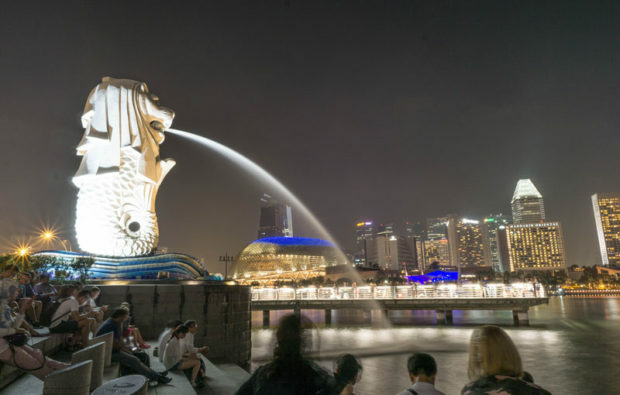 The Monetary Authority of Singapore (MAS) had another S$377 billion (US$273 billion) at the end of March, mostly invested in bonds. The third piece is GIC Private Ltd., which invests in stocks and bonds all around the world. The exact size of the assets isn’t disclosed, except that it’s “well over US$100 billion”. It could well be twice as much (or even more). 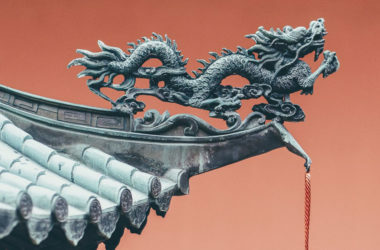 Given the strong government finances, it’s perhaps no surprise that the Singapore dollar has tended to gain value against the US dollar over the long run. In the 37 years since 1981 (the earliest data I found) it’s gained over 53%, working out at 1.2% a year (average with compounding). This is important for foreign investors, since currency strength has boosted historic investment returns, for example when measured in US dollars (and is likely to in future). 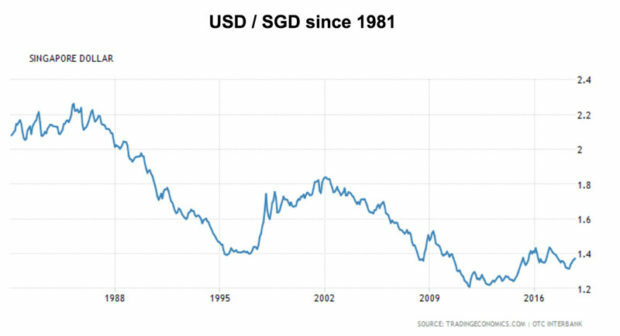 Below is a chart of how many Singapore dollars (SGD) could be bought with one US dollar (USD) since 1981. A falling line shows a weakening US dollar / strengthening Singapore dollar. You can see that the general trend is for a stronger Singapore dollar. That trend went into reverse in the late ‘90s (Asia crisis in ‘97 and generally strong US dollar), 2008 (global financial crisis) and 2014/2015. Sooner or later, it’s likely to resume the longer term trend (especially with the US cranking up its deficit spending once more). Are stocks cheap in Singapore? As a reminder, at the end of August the MSCI Singapore index had a trailing P/E of 13, dividend yield of 4.2% and price-to-book (P/B) ratio of 1.25. That sounds cheap at first. But, as I’ll explain, it’s probably trading around fair value. It’s all down to the type of stocks in the index. Investors can get exposure to the index via the iShares MSCI Singapore ETF (NYSE:EWS). This ETF was set up way back in March 1996 (which is antediluvian, in ETF terms). 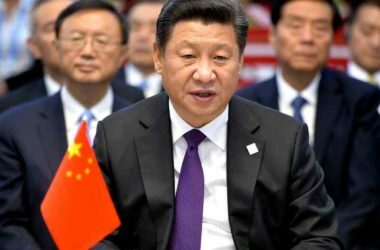 It had invested assets of US$723 million at the end of June, and charges a fee of 0.49% annually. Looking back over the past 15 years, to September 2003, investors in EWS made the equivalent of 9.5% a year in US dollar terms, including dividends (and net of fees). I estimate that around 1.5% a year came from currency appreciation (the strengthening Singapore dollar). 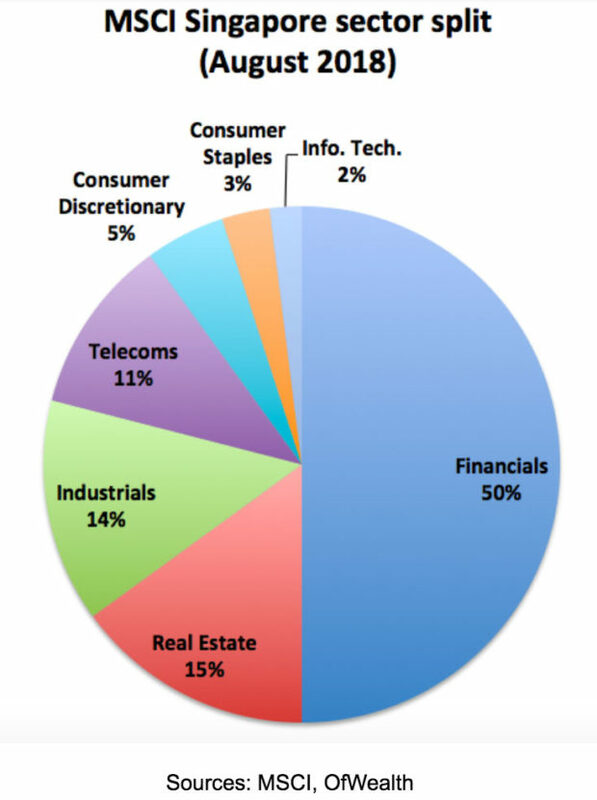 As you can see, a huge piece comes from the financial sector. In fact, 47% comes from Singapore’s three big banking groups: DBS Group, UOB Group and Oversea-Chinese Banking Corporation (OCBC). The next biggest sector is real estate, which basically means REITs, or real estate investment trusts (see here for a general explanation of REITs, and the kinds of returns that investors can expect from them). There is a wide range of REITs in Singapore. Most invest in Singapore, but some also invest in other countries, especially around the Asia Pacific region (Japan, Indonesia and Australia are favourites). 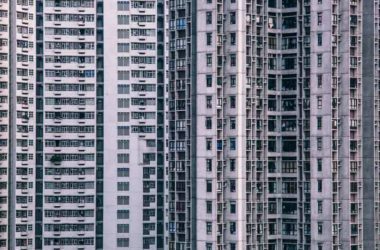 I’ve recently had a look through some of the larger REIT stocks in Singapore. They typically pay a dividend yield of 4% to 7%, but a few are currently outside that range. Lower yields usually go hand in hand with lower risk REITs, and vice versa. For example, prime office space in the central business district of Singapore is less risky than retail malls in Indonesia, and pays a lower yield as a result. On top of dividends, REIT investors can expect capital gains as properties increase in value (with modest debt leverage) over time. Something around 3% a year is a reasonable expectation. That means REIT returns are likely to be in the 7% to 10% range in the long run. I also did some number crunching on the index as a whole, derived from the known valuation multiples (P/E, P/B and dividend yield). The result pointed to long-term return expectations of about 8.5% a year, split almost exactly between capital gains from growth and dividend income. That 8.5% is in Singapore dollars. If the currency gets back on its long-term trajectory of strengthening against the US dollar, we can add another 1% a year (or more) for currency gains, when assessing return expectations in US dollar terms. 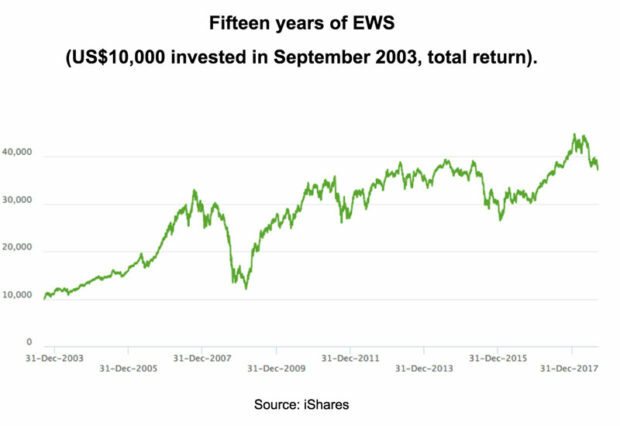 That would be in line with the 9.5% a year return from the EWS ETF over the past 15 years (through various cycles). My conclusion is that Singapore is an attractive place for investors, given its political and financial stability, but that Singaporean stocks aren’t cheap at the moment. Annual return expectations, in US dollar terms, should be set in the high single digits. That’s a solid level and in line with long-term historical returns from US stocks. As such, I’d characterise Singaporean stocks as trading around “fair value”, and not “cheap”. Returns are likely to be decent, but not spectacular.